Let us try to systematise the mess. A city consists of the physical, tangible, mostly immovable environment, the social component of people, institutions, workplaces or public transport, and the information infrastructure, from smartphones and urban dashboards to traffic counters and traffic lights. 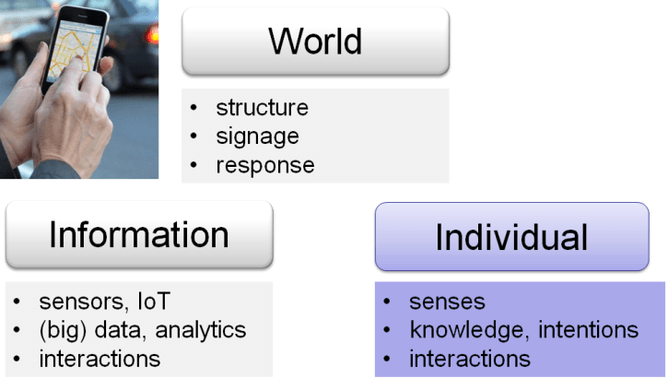 The relationship of the physical, the social and information (the virtual) forms a triangle: people make decisions and interact with the world (for example, moving around, building); they consult with information systems (location-based services, taxi apps or maps); and information systems control parts of the world (building access, bus preference at intersections, or dynamic road pricing) and interact with people (for example, pushing messages). Embedded in this picture is already a degree of connectivity unheard of only a couple of years ago. A rapid transformation of our cities is happening. This consists of three components: urban sensing, urban analytics and urban interaction. Each of these tells fascinating stories, and yet each is more or less hidden from attention. Connected vehicles communicate with each other or with other transport infrastructure about their presence and intentions, thus allowing for early braking, avoiding congestion, or ad-hoc ride-sharing. Smart waste bins sense their load and allow for optimising the routes of waste-collection teams, saving the cities significant dollars. Open data provides access for citizens and entrepreneurs, enabling public participation as much as transparency and empowerment. How do we make use of this new level of connectedness? As an example, imagine you want to visit a market in the CBD on a Saturday. Your first thought is to drive to the market, but you face the challenge of where to find a parking spot. Online services are starting to emerge that provide real-time data streams about where free parking spaces are available. However, this information may just increase the traffic congestion as everyone heads for the same parking spot. What we need is the ability to harness these new sensor data streams using predictive analytics, which can predict when and where parking spaces are likely to be free soon. Taking this a step further, we can envisage services that recommend the best time to leave home, or when to switch modes of transport. Rather than queueing for a parking spot at the market, we are advised to take advantage of cheaper parking spaces in the financial district (which is quiet on the weekend) and then take a free tram to the market. These types of data-driven services have the potential to transform the way we interact with our city. And yet we need a critical consideration of unintended consequences, intrusion of privacy, or unequal access. An important challenge will be how to find a balance between ease of access to these data streams and the privacy of citizens in our urban environment. New developments in privacy-preserving data analytics are helping to make this possible. This is done by randomising the raw data, while still preserving the important trends in the aggregate data. Let us close with an invitation to all Melburnians for a hands-on experience of urban connectedness. 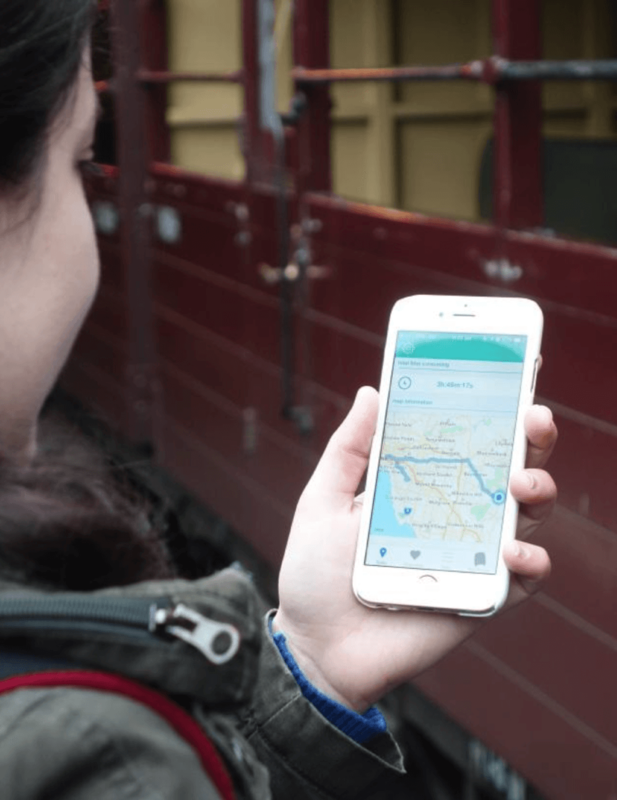 Until the end of November you can participate in a mobility survey using the sensors of your smartphone, and thereby sharing your day-to-day transport demand with researchers who explore ways to better inform governments on transport planning. Participants may be eligible for a $50 gift card. Click here for details. We think Melburnians are passionate about their transport system, and we want to look for ways to capture the joys and frustrations of travelling around this great city.